The story of New Haven’s development as a rail transportation hub is the stuff of documentary history. It is a multi-chaptered epic, sometimes laced with drama, perhaps unlike any in this country for a city of comparable size. Six separate railroads built into the Elm City from 1838 to 1871, paralleling and eclipsing the six turnpikes that radiated similarly out of New Haven. ‘Railroad fever’ succeeded ‘canal mania’ even as river and Long Island Sound transport continued to compete with, yet complement, the railroads, each of which brought new track, engine houses, turntables, freight houses, yards, wharves, office buildings, or other facilities. Passenger stations were generally shared by more than one road but even this was with some intriguing exceptions. The New York, New Haven and Hartford RR emerged dominant over this assemblage and developed it to its greatest extent around 1920. This paper hopes to broadly detail the origins of the separate facilities in New Haven and their evolution into the amalgam that the New Haven operated at its height. Much of this research relies on the invaluable accounts found in New Haven and other city newspapers. Primary source documents, important secondary works, and historical maps were also consulted. The Bailey and Hazen birds-eye map of 1879 [click here] is the most helpful graphic item, showing the facilities of the six original railroads in verifiable detail.1 Clarifications and comments on this work are welcome in what, like all good history, is intended to contribute to an evolving understanding of the past. The scholarly exchange of information contained here is encouraged. Reproduction in its entirety or in substantial part is prohibited under personal copyright privileges retained by the author. [6.1.1] The Hartford and New Haven RR was the city’s first steam railroad. It was completed on December 14, 1839, its purpose in part to join what were then the state’s two capitals. While Hartford was left with the sole honor in 1875, this shared political status bred rival commercial interests that would last well into the next century.2 Despite the fact that the H&NH was headquartered in the northern city, most of the funding came from New Haven, which was seeking a share of the Connecticut River traffic that Hartford and Middletown controlled. The H&NH considered routes via New Britain, Middletown, and Meriden, with the latter chosen as the most direct and least expensive. On the southern end, the Hartford road built to Steamboat Wharf, also called Belle Dock in honor of the steamer Belle that sailed from there. It was located at the westerly approach to Tomlinson’s Bridge at the mouth of the Quinnipiac River. The railroad bought a controlling interest in this toll-bridge company to gain the property it needed. A large freight depot, engine house, passenger facility, and dock were erected by the H&NH to connect with boats to New York. For the next decade this was to be the sole terminus of New Haven’s only railroad, bringing ever more traffic to and from Belle Dock after the road’s extension to Springfield in 1844. By 1850, the H&NH would also be operating branch roads from New Britain and Middletown feeding into its mainline at Berlin. 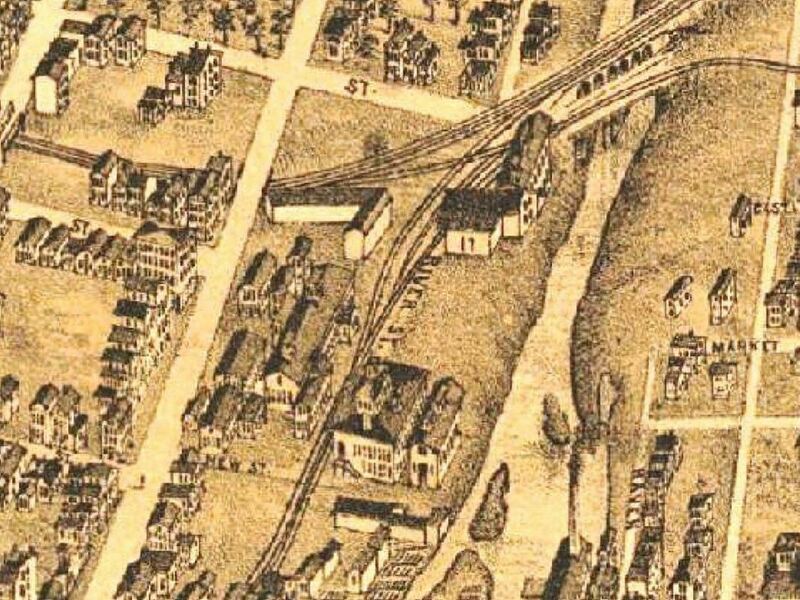 [6.1.2] From the Bailey and Hazen 1879 map, the Hartford and New Haven's terminus at Belle Dock is shown here. This would evolve into what was later called the Belle Dock branch of the NYNH&H with most of these facilities in place through much of the next century. The Tomlinson Bridge heads off down to the right of the railroad terminus. 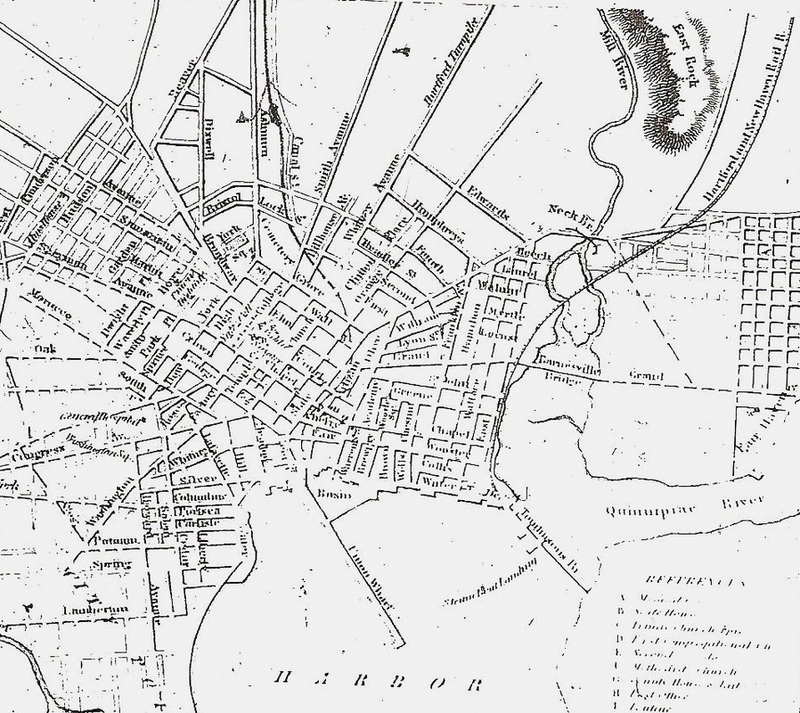 [6.1.4] This map is from the 1847-1848 Benham city directory for New Haven. This is the first in the series of directories that would be taken over and published by Price & Lee Co., headquartered right in the Elm City, well into 1960s. Note the Farmington Canal in the center leading down to the triangular basin at the top of the harbor. The canal would become a railroad on the next map. Union Wharf was already better known as Long Wharf for its nearly mile-long reach from the shore. 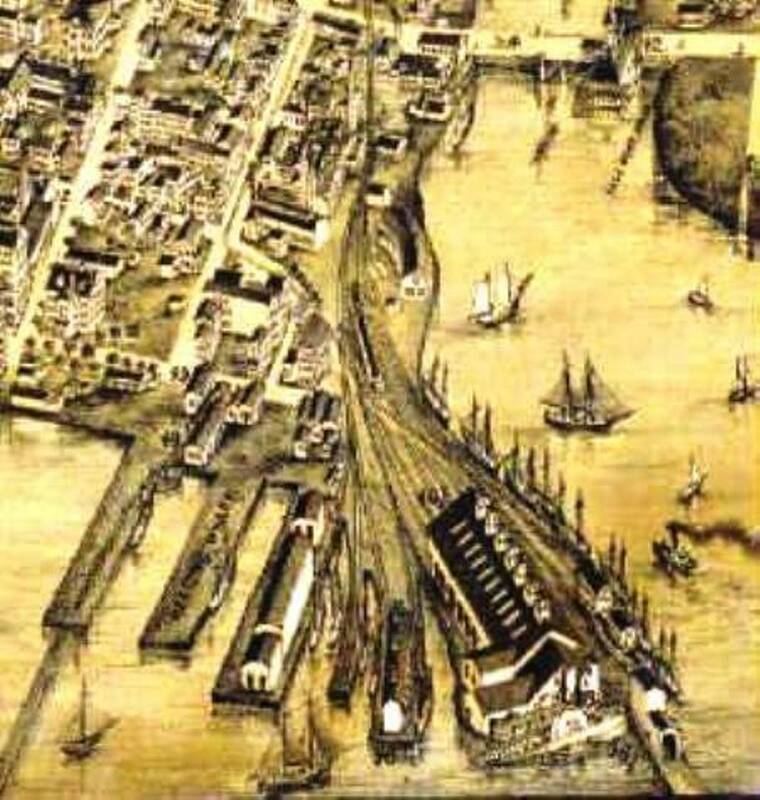 [6.1.5] The head of Long Wharf in 1868 is shown in this image, with the entire western half of the canal basin filled in. These are the facilities that were jointly built and shared by the NY&NH and its leased Canal road. Notice how the neck of land under the NY&NH track going west is complete now up to Long Wharf. 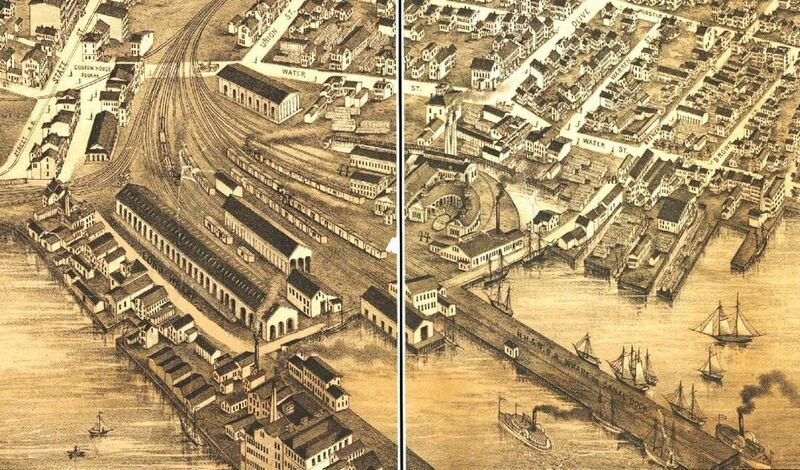 The natural silting of the harbor and the deliberate filling of the flats around the NY&NH trestle over to Spring St. would create the land that would help the Consolidated move much of its infrastructure from here in the 1870s, as well as build its 1875 depot on the 'made land' west of Long Wharf. [6.1.7] The New York and New Haven RR was coincidentally expected to present an engine at the basin on the very same evening the NH&N reached it, surely a remarkable sight for the Elm City. New Haven’s third railroad was nearly complete after four years of work both in Connecticut and in the Empire State where it was headquartered and where it finally arranged to share the New York and Harlem RR’s right of way from Williams Bridge to New York City. It ran its first regular train to New York from the Elm City on December 27, 1848.5 On the New Haven end, desiring to build from the business and population center of the city along State St., the NY&NH requested and received several route options from Alexander Twining, the Yale engineering professor who would lay out all of Connecticut’s early railroads. Options were explored for going via New Haven’s northerly streets and suburbs even as far as Derby or Danbury to get to New York City or just following the coast, which meant the costly bridging of the numerous rivers emptying into Long Island Sound. The more direct, coastal route prevailed. Click here for a digitized version of Twining's 1845 map of the "Experimental and Located Lines" for the NY&NH. Thought was given to it starting at Belle Dock and proceeding either along Water St. or just off shore but the offer of a lease late in 1847 from Joseph Sheffield, one of the first incorporators of the NY&NH and also president of the Canal road, was accepted and allowed the New York road to use the canal bed alongside the NH&N.6 Turning west from the canal basin, the road was built on pilings over the flats below Water St., which then actually marked the edge of the harbor. Twining said that this could be done fairly easily in the shallow water to start but would require more maintenance in the future. A 21-year lease of the NH&N effective on July 1, 1848, was signed but, due to delays in completing the NY&NH, the Canal road was not handed over until July 1, 1849. While some stockholders of each road were wary of this alliance, advantages came to both sides. The Canal road got annual rental payments, better facilities in New Haven, connections to the west, and a presumed ally in its northward expansion plans. The New York road got the traffic from the NH&N, perpetual use of the canal bed down to the harbor, and access to the basin property there. The railroads jointly set about beginning to turn the latter into usable real estate. The section reclaimed was the northwest corner where they built a substantial freight depot and engine house in October, 1848. On October 26, the Canal road started running trains from Plainville to Bridgeport using the track of its lessee from New Haven, this even before the New York road was fully open. 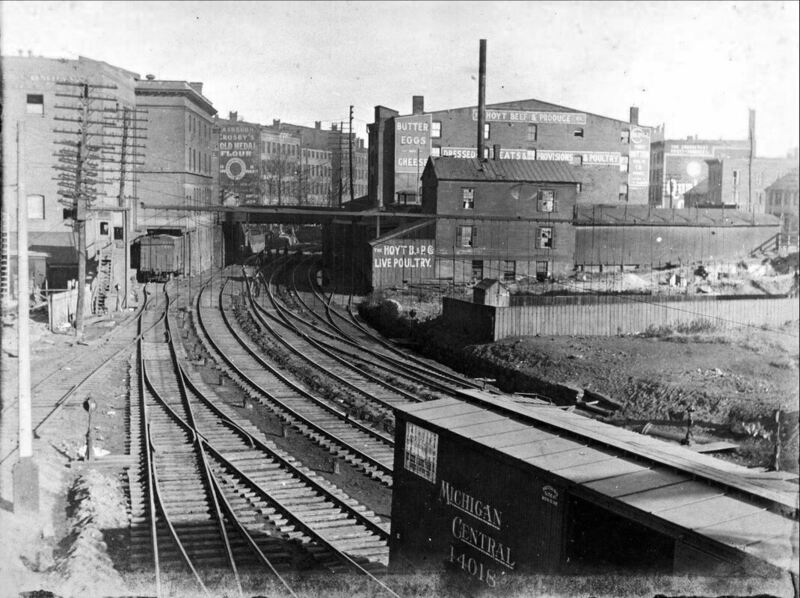 The NH&N utilized the basin facility for western freight and seaborne cargo and, for its northern customers, it used the Temple St. facility, which appears to have been discontinued by January, 1849, probably timed to the completion of a new union station.7 Profitability jumped immediately upon turning the canal into a railroad with a net of just over $37,000 on receipts of $60,000 for 1848.8 The NY&NH later claimed it was losing money on the NH&N, probably due to the high rental payments it had agreed to pay. [6.1.8] This 1879 view of Henry Austin's 1848 depot is quite accurate. The large atrium on the front, adjacent to the Chapel St. tower (right), was most likely added after 1875 when the structure was converted to an upscale city market. The detailed architectural plans are at the New Haven Museum. [6.2.2] Thus, by the beginning of 1849, New Haven had three railroads that were functioning more or less as two. Almost immediately the two principal roads found reason for cooperation, albeit guarded. The NY&NH, not interested in freight revenue, was looking to capture as much as it could of the Hartford road’s 300,000 annual passengers to and from New York, the connection with the Western RR in Springfield creating an all-rail route from Boston. The Hartford road, content with the steamboat arrangements it had at Belle Dock, was not particularly interested in a connection with the NY&NH and feared reprisals from the competing Connecticut River boats. Its other concern was that Canal road would extend north and siphon off its Western RR traffic. The NY&NH assuredly had this fear in mind when it leased the Canal road. The NH&N would get as far as Granby, with branches to Tariffville and to Collinsville, all in 1850. The latter was for the coveted traffic of the Collins Mfg. Co. there and with an eye toward going on to Pittsfield, Mass. At that point, however, the NY&NH quietly began to help stall the NH&N. In return, the Hartford road consented to share the NY&NH’s rental payment on the Canal line, to run H&NH passenger trains into the new Austin depot instead of Belle Dock, and, by April, to suspend its own day steamer, the Commodore, to guarantee more passenger traffic on the NY&NH. This effort was supported by Cornelius Vanderbilt, whose interests in these boats were being subordinated to his investments in both the NY&NH and H&NH. 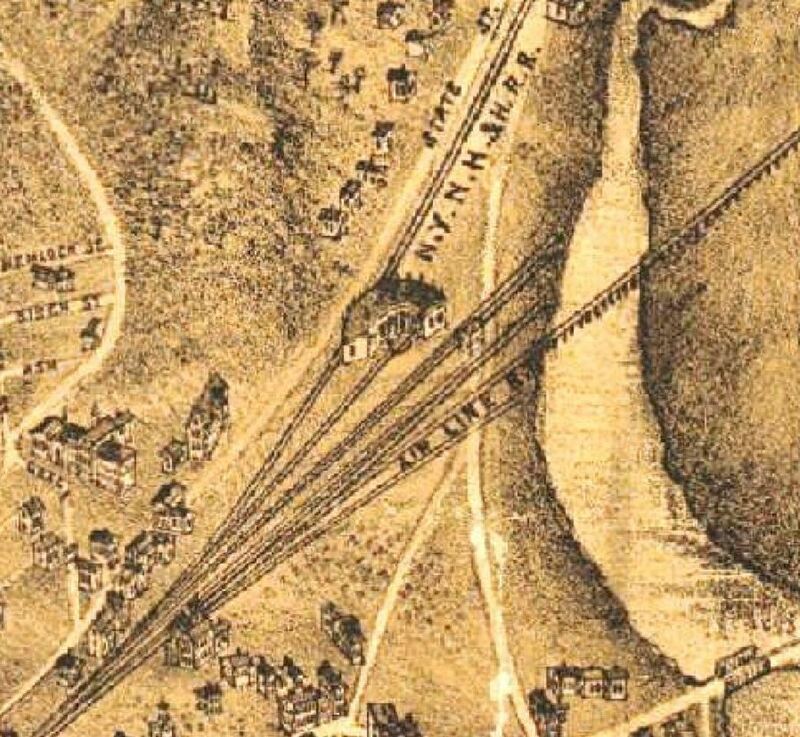 By January 27, 1849, the NY&NH had extended its track from Chapel St. northward to a junction with the H&NH at the ‘tin bridge’ over the Mill River. The metal-covered, wooden deck of the bridge here gave this structure its nickname that was found elsewhere on railroad bridges outfitted similarly. On January 29, 1849, the first H&NH connection was made with a train to New York.14 The fact that the several contracts between the NY&NH and the H&NH all expired on July 1, 1869, the same date as the NY&NH lease of the NH&N was up, seems to show that the principal parties were intent as much on keeping each other in check as simultaneously reining in the Canal road. [6.3.2] In 1852, the New Haven and New London RR built to Mill River Jct. From here they leased a right of way from the NY&NH, which had built up to this point to connect with the H&NH. The NH&NL laid track to Grand St. and used the NY&NH to get to the Austin depot just below. The arched bridge was called the Neck or Tin Bridge, the latter apparently for the metal-covered deck below the track for protection against fire. [6.3.2] An 1868 view of Mill River Jct, soon to be rechristened Shore Line Jct. with the reorganization of what had become the NHNL&S by 1864 after absorbing the New London and Stonington RR. Notice the complete facilities, including the turntable which is not on the 1879 map above. Given the accuracy otherwise, it is hard to believe that the bird's-eye artist missed this. The NY&NH leased the Shore Line Rwy in 1870 and perhaps had better use for the turntable elsewhere in its growing system. [6.3.6] This is the site of the New Haven, Middletown and Willimantic's original 1870 facilities at Cedar Hill. East Rock is beyond the hollow on the left, west of State St. This was the starting point for the NYNH&H's massive Cedar Hill yard. One of the streets nearby on the east side of State St. today is Lyman St., probably in honor of NHM&W founder David Lyman, after whom the Lyman Viaduct in Colchester was also named [click here and here]. [6.3.7] New Haven’s sixth and final steam road was the New Haven and Derby RR, which opened on August 9, 1871. It had received permission in 1870 to go beyond its intended terminus on the NRR, known later as Derby Jct., and end instead in Ansonia, Derby’s northernmost borough. This was touted in the NHD&A lettering on its engines. While necessitating extra bridgework to cross and re-cross the Naugatuck River, this wise move brought it to the front door of factories like the Birmingham Iron Foundry and the Farrel Foundry and Machine Co. The Derby road was unique from the start, being born out of New Haven’s regret over the Valley traffic lost when the city spurned the Naugatuck RR’s request for a stock subscription in 1845. The NRR then headed south from Derby instead, and, lured by the offer of a free track from Naugatuck Jct. (Devon), ended in Bridgeport, the offer coming from the ever-astute NY&NH looking to get more traffic to the Empire State.23 The afterthought NH&D was expensive to build, often controversial, and required city financial assistance for which the mayor and one alderman were given seats on the board of directors. In New Haven, the NH&D built under and at grade from the West River through Custom House Square at State and Water Sts. to meet the track of the Canal road at Fair St. and thence reach the Austin depot just above and the NH&N freight facilities it initially used at the Canal dock below. The NH&D put in its own turntable below West Water St. between Meadow and State Sts. in 1871. By 1874, it filled in enough of the flats here to build its own engine house, freight depot, and a small freight yard, as well as leasing a small wharf adjoining the Canal dock and building an access track down from Fair St. to reach the waterfront. [6.3.8] These are the New Haven & Derby facilities as of 1879. The turntable was installed in 1871, the freight house in 1873, the engine house in 1874, and the passenger station in 1878. Truly accurate for the most part, our birds-eye artist here has erred with the Derby passenger station. It had a Mansard roof with steeply pitched sides, as shown in later photos. Compare with the roof on the Consolidated depot below. [6.4.1] The event that was to forever change New Haven and its railroads took place on August 6, 1872. This was the debut of the New York, New Haven and Hartford RR, the official merger of the NY&NH and H&NH, which had been jointly operated since August 3, 1870. The lesser-partner H&NH cooperated out of its renewed fear of competition from the recently unshackled Canal road.24 A new depot, already spoken of for years, was immediately in the offing to replace the Austin structure, still much-maligned and now greatly over capacity as well. The bustling NH&D alone was carrying as many as a thousand passengers a day into New Haven.25 The old depot was being called a ‘black hole’ by the Register as late as May 17, 1865 and in 1866 the state ordered the NY&NH to improve conditions to the satisfaction of the city and the legislature.26 These factors, plus the undoubted wish of the ‘Consolidated’ road to herald its birth, all argued for a new structure. Ground was quickly broken in an entirely new area reclaimed from the harbor just southwest of downtown New Haven. Pouring fill around the original NY&NH trestle out in the flats appears to have facilitated the process. 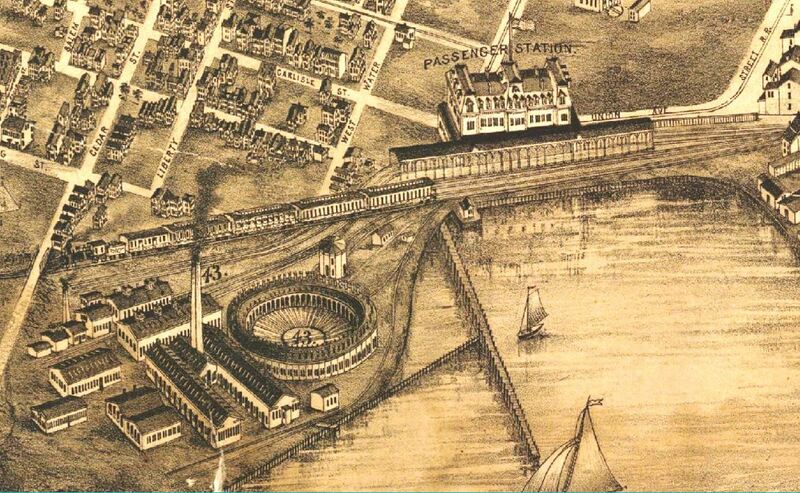 By 1859, maps show the line sitting on a spit of land extending northeast from Spring St. and almost reaching Long Wharf. The deliberate filling of the flats and the natural harbor silting gradually diminished this inlet where the old West Creek once emptied. The Consolidated reportedly considered building south of the Austin depot, a proposition that many preferred, but decided that the parcel here was the only one large enough for its needs, according to the newspaper “for all time to come.”27 This was a wise choice for the railroad because further filling of the harbor would enable the company to expand freely and this ‘made land’ was also blessed with no buildings to dodge or streets to cross. The NY&NH purchased real estate and water lots here, the largest parcel by far coming from the Derby road, to complete its ownership of the entire waterfront from Long Wharf west to Oyster Point in 1873.28 The far-sighted New York road had begun to acquire land on the southwestern edge of the harbor as early as 1866 when it bought the Gerard Hallock estate.29 The railroad leveled the bluffs there by moving 125,000 sq. yards of material on construction trains to stabilize the marshy depot site at the foot of Meadow St. Long trains of empties used the New York 'down' track to access a temporary spur to the mud flats. As the excavation work threatened to destabilize the mansion, it was purchased by NYNH&H Master Mechanic Henry J. Kettendorf and moved across Howard Ave. to a lot he purchased.30 Using stones from Hallock’s sea wall to buttress the rail yard, a full roundhouse, turntable, and other structures would be built here by 1870 to take the place of those on Long Wharf. All the Consolidated would leave there was the car shop building, lengthened and converted for use as a freight house with additional tracks surrounding it. 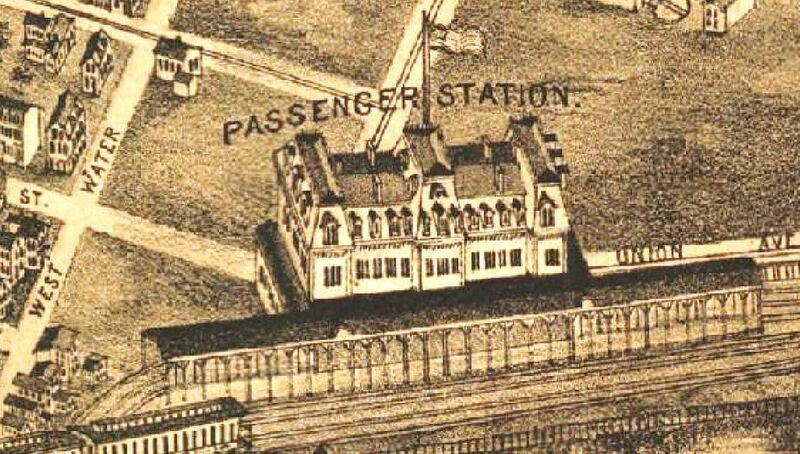 [6.4.2] This is the NYNH&H's 1875 station. Note the Mansard roof, the steeply sloped second roof with gabled windows, which is accurately depicted for this building. Most of the land here was bought from the Derby road and filled in by the Consolidated to support the station and other structures. [6.4.3] A wider shot of the entire Consolidated complex in 1879. Note the full roundhouse to replace the one that was dismantled at Long Wharf, and also the numerous other structures. Work on this complex reportedly started in 1869 and culminated with the 1875 station. The tiny Derby road facilities are right above those of the mighty Consolidated. 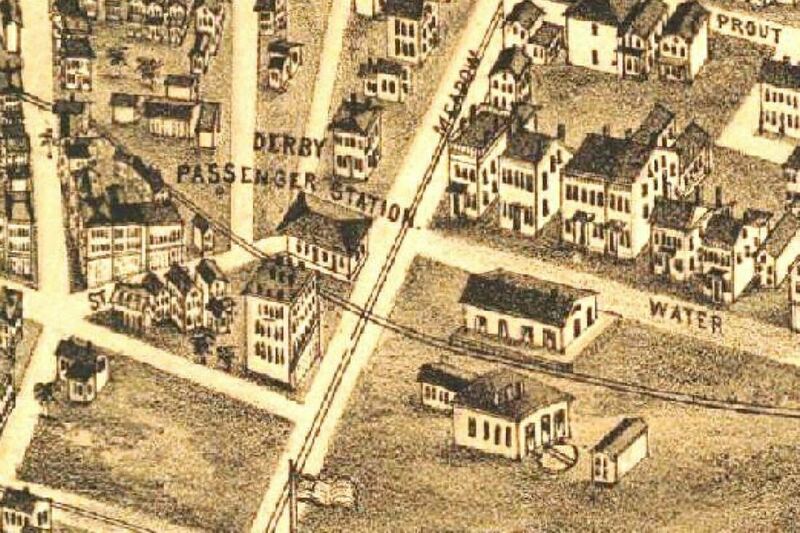 The Derby depot location from 1875 to 1877 was in the small building, second in from the corner of State St., just above the 'St' in West Water St. From March of 1877 until June of 1878 it would move to structure built adjacent to the track at State and West Water Sts. 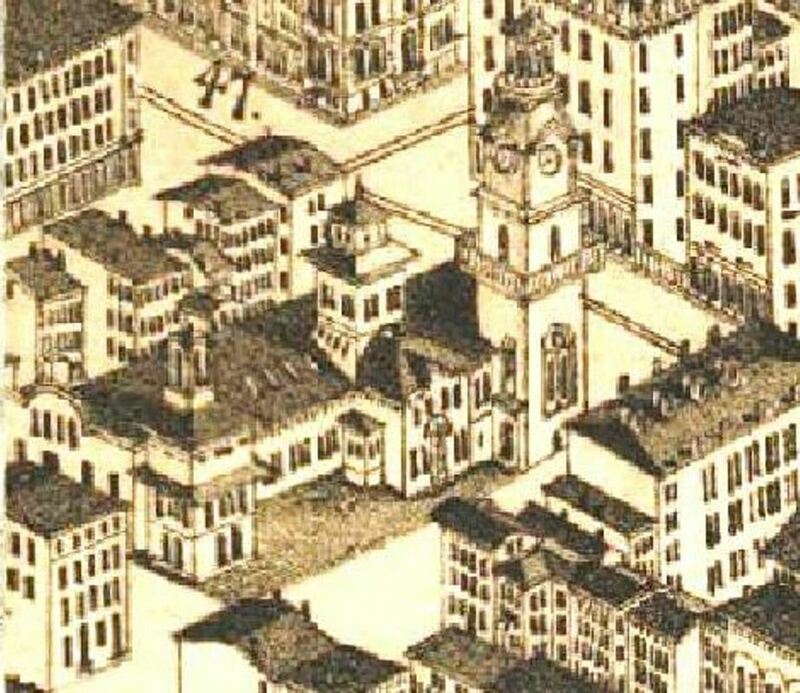 The empty land in the eastern corner of State St. and West Water St. was cleared in 1873 to provide expansion space for the NH&D. [6.4.5] So the situation was as of mid-1875 that the Consolidated, its leased Shore Line road and the still-independent Canal and Air Line roads were all using the new Union Station. Because of its solitary entrance from the west, the Derby road was the only one left out of this arrangement. Access was still possible by crossing Custom House Square and backing down but this was cumbersome and dangerous with the trains of five other lines funneling into the NYNH&H station. The NH&D, with its four or five daily trains, could also still have used the Austin depot, but this too did not happen. The Derby road chose instead to stay independent and rented office and depot space at 211 West Water St., just west of State St. and across from its track. This single diversion of passengers from the Chapel St. station was said to have caused a considerable drop in use of the street car line that served the ‘old depot.’ While most of its passenger traffic was local, Derby road customers who needed to make connections to Union Station a block south did so easily on foot. Baggage was transferred free of charge. Because passengers had to cross West Water St. to access trains from the new location, the station was moved to a building on the southwest corner of State, right on Custom House Square.35 To save the rental costs, the NH&D opened its own passenger depot in June, 1878. Tucked into the southwest corner of Meadow and West Water Sts., it was a two-story brick structure, 70x22 feet, with three rooms for offices upstairs.36 The ground level was said to be arranged similarly to Union Station. The exterior sported a Mansard roof, perhaps deliberately imitative of the mighty Consolidated’s new depot. 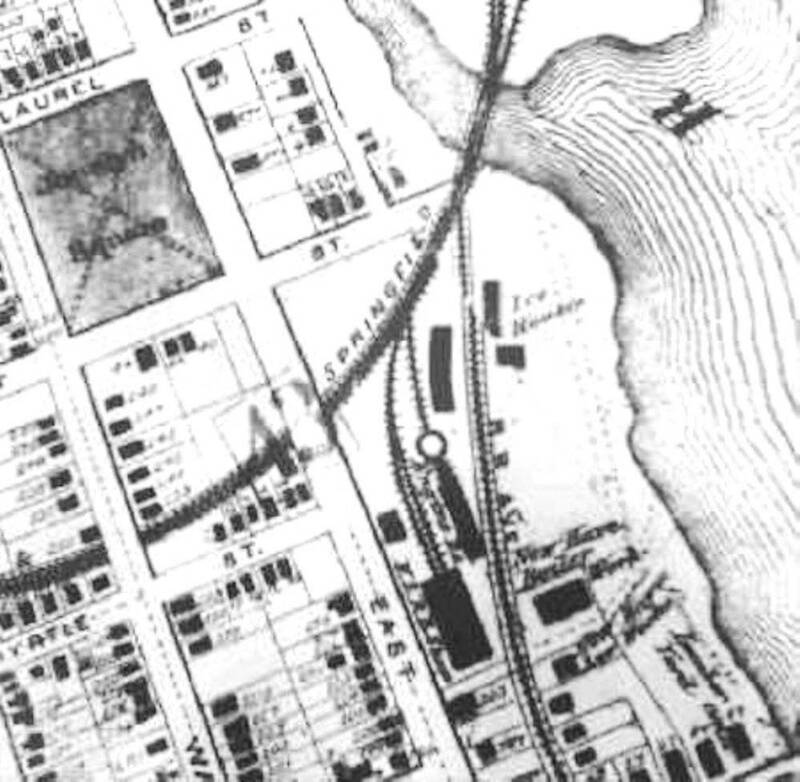 Pursuant to the sale of the land for that depot, the Derby road got its lease of the right to cross over Consolidated tracks to reach the harbor changed from annual to one in perpetuity on October 9, 1873.37 It laid its own track from Fair St. down to Brewery St. and leased a small dock there on the westerly edge of Sheffield Wharf in 1874 and expanded it in 1877.38 It was here that the New York-based ships the John H. Starin line would begin to dock, forming a through route from the Valley to the Empire City via the NH&D. 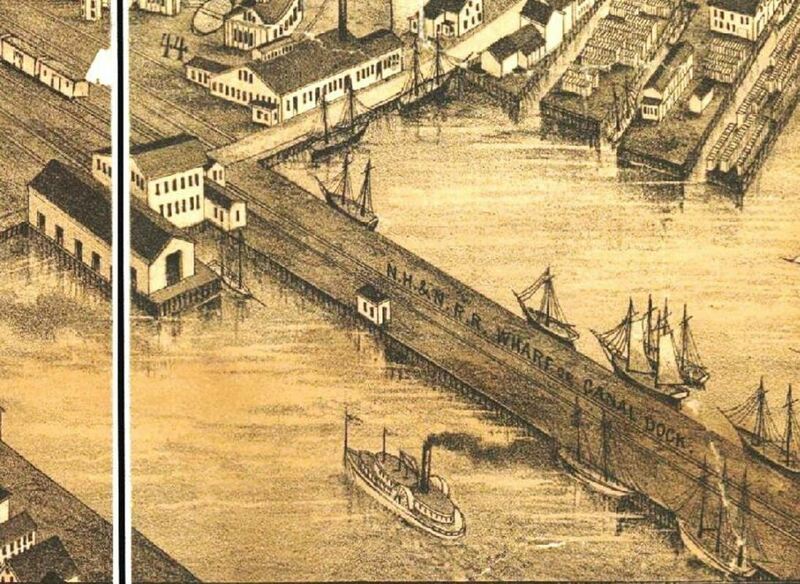 [6.4.6] This shot shows the head of Long Wharf (left) and also the Canal road facilities (right) on the east side of the basin that was filled in back in 1869-1870. Note the absence of the turntable and domed engine house that the NY&NH and the NH&N built jointly in 1848. The only NYNH&H building left is long freight house, formerly the car shop. [6.5.2] The Derby road’s new westward thrust was also reflected in its property in New Haven. For public safety reasons, the city had grappled for years with ways in which the NH&D, while maintaining its independence from the NYNH&H, could move its operations base west of Commerce St. and run to the wharf only during nighttime hours. Nearby land for a new yard was acquired -- discreetly. The Consolidated was not above spoiling such plans, such as the 1899 Granby land grab to block the Central New England’s line to Springfield would show.46 Jabez Bostwick, who succeeded Charles P. Clark as president of the NY&NE in December of 1886, purchased much of the land personally and later transferred it to the NH&D.47 Permission to abandon the old depot location was given by the railroad commissioners on January 1, 1888. The new yard complex was in the area enclosed by Cedar, Silver, West Water, Minor, and Commerce Sts. On the north side Hill and Lafayette Sts. were closed at Silver, which was extended to Commerce St. to move traffic around the block. The railroad commissioners kept Liberty St. open and ordered a bridge to go over the yard here to pacify residents who complained at hearings about the street closings. In spite of what probably were sincere efforts on the Derby road's part, legal complications delayed the fulfillment of its promises to the neighborhood and caused some animosity toward the NH&D and the HRR.48 At the southwest corner of Commerce and Silver Sts. the NH&D built a three-story building for a new passenger station and offices above. It was from here that an inspection train ran up the newly completed Extension on October 14, 1888. A wonderfully detailed description of the new line and the challenges of its construction ran in the Register, and said that monumental project began on August 21 and the last rail was laid at 3:30 on October 3.49 On Wednesday, October 17, an inaugural train departed at 10:30 a.m. William H. Stevenson, the NH&D president as well as the HRR’s vice president and general manager, proved himself to be something of a P.T. Barnum as well. The Wheeler & Wilson band from the HRR’s headquarters town, Bridgeport, was on board the flag-and-bunting-decked, four-car train, as well as railroad officials, local dignitaries, and newspaper men. The entire train reportedly disembarked at Shelton, then the only stop on the new line, for music and festivities witnessed by a crowd of 500 residents. The piece de resistance was yet to come. The technical meeting point of the two railroads was about four miles above Derby Jct. but, apparently for effect, Stevenson chose a spot a mile and a half north for a spike-driving ceremony. This was overlooking the Housatonic River at a 200-ft elevation, the magnificent vista enhanced by the beautiful autumn foliage. At precisely 12:00 noon Stevenson drove two spikes, to the accompaniment of music, huzzahs, and celebratory cannon fire. One spike was of solid silver and, in a patriotic tribute, the other was a gold-plated spike of copper made from the nails of the venerable U.S. warship Colorado, which had recently burned off the coast of Port Washington, New York [click here]. The spikes were then lifted to be preserved at the Housatonic offices in Bridgeport.50 The train resumed its course, passing the point opposite Zoar Bridge where a station would soon be named ‘Stevenson’ by grateful locals, going on to Danbury for festivities, thence down to Bridgeport, and back to New Haven later in the evening. [6.5.3] Even as the hoopla was fading, work in New Haven was proceeding. Instead of tearing down the 1878 passenger station, the NH&D earmarked it to serve as the freight office and moved to the south end of the new building. With the Extension certified as safe by the railroad commissioners, the composite structure was expected to be fully opened with regular train service commencing on November 26, 1888.51 The shed over the passenger platform behind was said to cover “several thousand” feet of track. On February 19, 1889, a 73-ft freight house was opened facing West Water St. behind the freight office. A site further along at West and Thorn Sts. was also acquired for a new four-stall engine house and turntable, which were in place by May, 1890.52 Interestingly, some of this land was owned by Morris Franklin Tyler.53 To cement their relationship further, the Housatonic leased the NH&D on July 9, 1889, effective the following day.54 NHD&A engines 1 through 5 would be renumbered into the HRR roster as 47 through 51 while newly purchased engines were numbered 30, 31, 33, 34, and 35. The new ones, and presumably the old, were now lettered simply as NH&D. Early in 1891 the #30 was delivered and the other 4 were still on order, as well as 10 new passenger cars and 100 new freight cars, all expected to be delivered by April 1 at a cost of between $175,000 and $200,000.55 Ansonia’s nominal loss of status as Derby road terminus was compensated for by its increased prosperity as a branch of the HRR system. 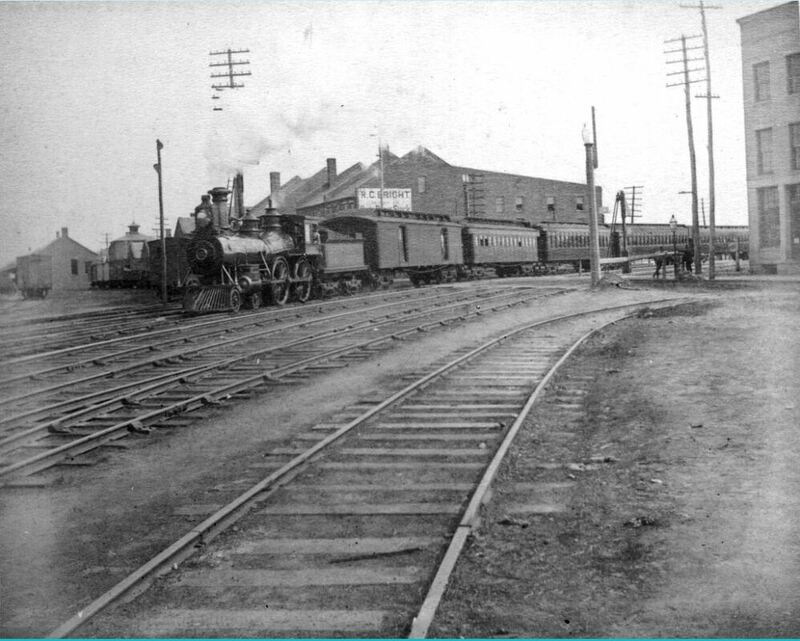 Expansion of the freight yard by filling in the land and laying additional tracks "to take care of the large increase of business at that point" was underway in 1890 and was expected to be finished by January 1, 1891. Work here also included a new turntable and there was talk of the NH&D recrossing the Naugatuck River to extend to Seymour or even Waterbury.56 A Register article shortly after the Extension opened said that Ansonia businesses were saving $10 per carload via the new routing and that this would "plough a very big furrow in the Consolidated road's traffic" in the lower Valley.57 Merchants in New Haven were “astonished” at the benefits. 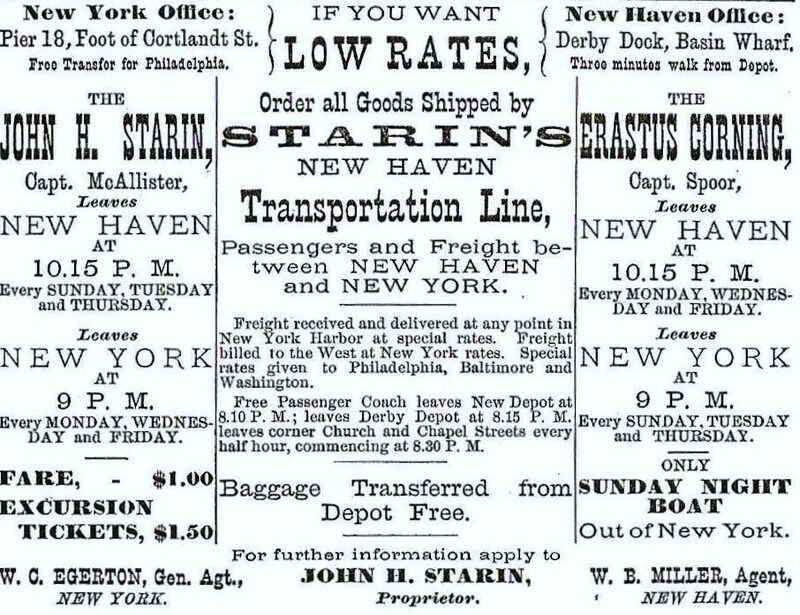 Lower shipping costs, easier access to the NH&D freight house in contrast to the congestion at Long Wharf, and even more politeness from the Consolidated, which was now facing some real competition, prompted one customer to say that “now everything is as nice as pie.” This increased traffic on the NH&D, with its tidewater connection to New York via the Starin line, had become more valuable than ever, to be protected from those who wanted the removal of the tracks through Custom House Square or any other change that would make the NH&D less competitive with the Consolidated.58 There was a substantial increase in passenger traffic as well. By 1892, 50 trains per day were using the NH&D terminal, a four-fold increase from 1887.59 A 500-ft freight house had been opened on Silver St., a restaurant was operating in the passenger station, hackmen were 'red-lined' at the curb outside, and plans were being made to double-track to the West River and possibly beyond. Permission from the railroad commissioners came in May of 1892 to take more property to expand the NH&D yard.60 All of this brought it ever closer to confronting the Consolidated, which displayed a seeming indifference toward the competition prospering right across Union Ave.
[6.6.1] The staid demeanor of the Consolidated would soon change. It too was looking to expand here. Whereas it had once offered the lot in front of the Meadow St. station to the city on condition it be made into a park - a proposition the city declined - by 1891 the offer was not only withdrawn, but more land was being sought.61 The Consolidated’s plan was to build a new, larger station, and to convert the old one, “crowded from basement to attic,“ into an office building.62 An addition had already been put onto the west end of the building, at the direction of Charles P. Clark, newly installed as president in March of 1887. This enabled him to move the executive offices from Grand Central Terminal to New Haven, an operation completed on November 26, 1887. The addition included a new assembly hall for the stockholders, first used on December 21, 1887 for the annual meeting.63 These changes aside, the space crunch continued, with a new station still seen as the ultimate answer. The old Chapel St. location was even rumored for the site of this new station.64 Urgency, however, was injected into all of these plans when a fire on March 19, 1892 largely destroyed the third floor of the Meadow St. station.65 To get by for the time, the Consolidated re-roofed the second story leaving only the two patched-up end towers above it, and redeployed office staff as necessary. The spatial pressures here mirrored the tension on the tracks. As of April 1, 1887, the Consolidated had put itself in direct competition with the HRR/NH&D by leasing the Naugatuck RR. Not surprisingly, the 1880 NH&D/NRR pooling agreement was discontinued as of October 1, though apparently this was mutually agreed upon.66 There was also talk of the Consolidated attempting to renege on the agreement allowing NH&D trains to cross its tracks to get to Starin's Wharf. Late in 1887, "a frog" arrived that was used to join the NRR to both tracks of the NYNH&H at Naugatuck Jct., today's Devon, thus restoring a connection to New Haven abandoned when the NH&D opened in 1871.67 And, should it become necessary to further marginalize the value of the Derby road, the old NRR plan for a line from Woodmont to Wheelers Farm was dusted off at this time.68 Land issues and interchange difficulties both in Bridgeport and Norwalk also fueled the hostility as did the 1889 legislative battle wherein the HRR lost a bid to essentially become one of the last parallels and expand its system to better compete with the Consolidated.69 Public opinion was, of course, overwhelmingly with the underdog HRR. Midway in 1892, the simmering pot of issues boiled over with a stunning series of events to deal with an HRR that then-new directors J.P. Morgan and William Rockefeller recognized as no longer a 'streak of iron rust' but rather 'a thorn of the most formidable kind. '70 On Friday, June 10, they reportedly paid a large premium to purchase majority control of HRR stock. The New York syndicate that sold out used the excuse of uncovering some HRR financial irregularities to explain its hasty exit.71 On the following Wednesday, Stevenson and the rest of the HRR officers and managers resigned and were replaced on legal documents by Morgan, Rockefeller, and other NYNH&H officials.72 On June 18, just days later, the Courant reported that “the first complete Consolidated road train to run over the Housatonic went up the Derby branch from New Haven Saturday. "73 The Consolidated lease of the HRR was effective on July 1.74 Next, New Haven’s board of aldermen received a petition with several startling proposals. These included the construction of a new Union Ave. above the old, the discontinuance of the streets below it for yard expansion, and the elimination of NH&D tracks east of Meadow St. by November 1, with access to the Derby terminal thereafter only from the west.75 And, finally, the NYNH&H petitioned the railroad commissioners for permission to construct a new connection, dubbed the West River branch, to bring Derby line passenger trains into Union Station. The customary maps, undoubtedly drawn up earlier, were submitted to the commissioners with the application on July 16 and approval was given on August 1 after a hearing in New Haven on July 22.76 While the Consolidated had every right to move quickly, the breakneck speed, from costly purchase, to new Union Ave., to hasty lease, to action on the West River branch, all within six weeks, not to mention the personal involvement of Morgan and Rockefeller, seems to indicate premeditated planning and a real urgency to get rid of the HRR and its leased NH&D. Track 6.8: The Dawn of a New Century, 1900 - 1920. [6.8.1] This valuable, historic photo is thought to date to 1904 and shows the southern end of the famed railroad cut, originally the Farmington Canal, between Fair and Water Sts. The tracks narrow to three as they go north toward the site of the old Austin depot that burned in 1894. The width limitations and the height restrictions under the overgrade city-street bridges led the NYNH&H to undertake the massive widening and rebuilding project in 1906 that would triple the width and improve the bridge clearances as well. [6.8.2] Ca. 1905 train has just left the 1875 Union Station, out of sight to the right, and is crossing Water St. at the head of Long Wharf. Which of the four lines east and north it will take is not determinable. By now the NYNH&H owned or was soon to own outright the Canal line, the Air Line, and the Shore Line. The bottleneck from here and up to Mill River Junction would compel the railroad to undertake the massive widening of The Cut in 1906. [[6.8.6] As already mentioned, talk of a new union station dated back at least to the station fire of 1892.116 The talk would be 20 years old by 1911, when George Dudley Seymour, 'Mr. New Haven,' would describe the old Meadow St. depot as the “shabby and deformed structure by which we are now so widely known.”117 As far back as December, 1890, the common council had wanted Union Ave. extended down to Spring St. The Consolidated opposed this and petitioned in 1892 for a new Union Ave farther north to encompass the expanded operations base it sought.118 Ultimately it was constructed angling from the corner of Water and State Sts. down to the intersection of Spring and Liberty Sts., and not until after the GOB opened early in 1894, the street area being used to store construction materials. 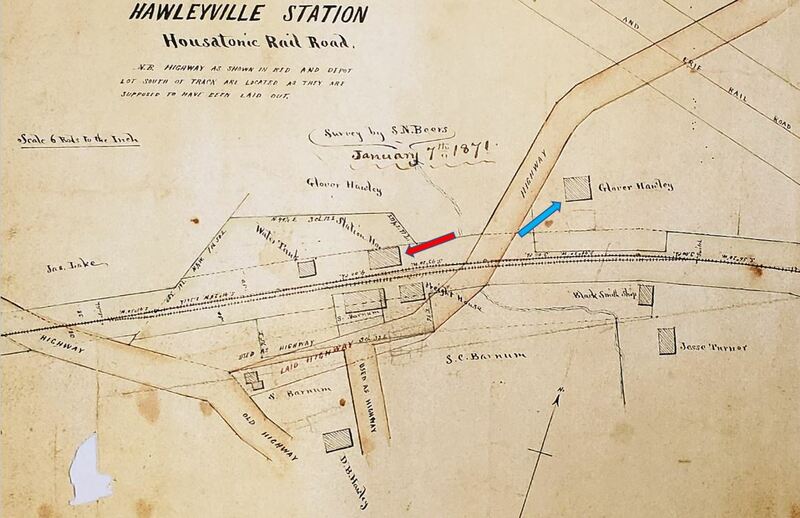 The contract for gutters and sidewalks was not awarded until November 28, 1898.119 As tracks were filled in east of the station, old Union Ave. became a cul-de-sac fronting the depot until 1917 when the street disappears into the railroad’s property. City Engineer Kelly’s 1911 real estate atlas has caused confusion on the timing of these changes. This is due to the fact that map plates 15 and 25 show, not the reality of 1911, but rather the arrangement of streets, tracks, and the new depot location projected for 1918. The key is the word ‘proposed’ on the latter plate where Long Wharf tracks are shown as paralleling Brewery St., instead of ending at it. This part of the railroad’s plan never became a reality and, probably for reasons of financial hardship and large outlays elsewhere, the railroad had to scale back its plans and delay the new station. Preliminary site work for it would not begin until 1916. The 1875 structure was closed on June 10, 1917 as part of the transition. Tracks were laid north of the old building and platforms, train sheds, and a sizable wooden station were built there. Benches, ticket cages, and restaurant equipment were moved to this temporary depot from the old station behind it. What had become a small freight yard along Union Ave. was then used for pocket tracks to the east side of temporary station. The “first spadeful” of earth for the new union station, just west of the temporary one, was turned by company engineers on April 17, 1917. Building permits were pulled on January 3, 1918, and the steelwork was up by September.120 On May 8, 1918, the old depot again caught fire and was completely destroyed this time. Employees hastily moved records to nearby railroad facilities and to the dining room of the Hotel Garde at Columbus and Meadow Sts.121 The 1875 station site was soon covered by more yard tracks. [6.8.8] As much thought was given to the outside layout as to the interior. A 45-ft setback from Union Avenue had been mandated by the city and allowed traffic to circulate around an off-street driveway and safety island in front of the building.124 Trolley lines also converged here and circled efficiently around a loop up Portsea, and down West Water Sts., and thence along Union Ave. to Carlisle St., to Meadow St., or to the trolley viaduct in The Cut. All this was easy enough for the NHRR to orchestrate since it, of course, owned all the streetcar lines by now.125 The NH&D stub-end track was tied into this network to allow car storage at the Silver St. yard. This yard would even see occasional passenger service for special events. For the Yale-Princeton game in 1911, when 20 special trains crowded into the Meadow St. station, Silver St. once again received Valley trains, while the tracks along Union Ave. opposite the GOB were used to hold the private cars of wealthy sports fans. These tracks probably dated back to the Yale bicentennial week in 1901 when the railroad slept thousands for that event in rail yards, steamship berths, and available space in the old station and the GOB.126 These tracks would be brought up to the east side of the Gilbert station in 1920 once the temporary wooden depot was dismantled. [6.9.1] It is always tempting to speculate on the ‘what ifs’ of the past. What if, for example, the HRR/NH&D had been able to stave off the 1892 takeover by the Consolidated? Subsequent history might have been different for a while, but the NYNH&H probably would have won out later and further railroad construction and competition would have been costly and destructive in the longer term. What if the dramatic increase in automobile ownership in the 1920s and the decline of manufacturing in the Northeast after WWII did not happen? These were to be insurmountable challenges many railroads would face, the New Haven among them, succumbing to a second and final bankruptcy in 1961. These same factors would also cause cities to feel the pain of decaying downtowns and loss of an industrial base. Urban redevelopment came as the solution and New Haven was a prime candidate. The Hill neighborhood where residents once resisted the expansion of the NH&D would become the site of Lee High School and public housing. The Model Cities program Hill Project would take out the Silver St. yard and the RR YMCA, which closed on April 30, 1966.130 Its functions were transferred to the GOB and to the Cedar Hill YMCA branch. Two years later in 1947, the NHRR would emerge, temporarily resurgent after its first bankruptcy, to build a new headquarters just west of the GOB across Meadow St., once again requiring engineers to take soundings and drive pilings deep into the ‘made land’ here. The GOB, sold to the Knights of Columbus in 1952, remained their headquarters until they built their present building in 1969.131 The GOB itself fell to redevelopment in 1971, its site occupied by the New Haven Police Dept. headquarters since October, 1975.132 Much like the NY&NH pushed back the harbor waters in the 1800s, the building of the Connecticut Turnpike would push them even farther in the 1950s, an ironic nail in the coffin for the railroad that brought in the construction materials for its nemesis. This work would finally take out New Haven’s fabled Long Wharf. North of here, a new State St. station would open on June 7, 2002, diagonally across Chapel St. from where the Austin depot once stood, belatedly recognizing a century of complaint that this location is closer to the real heart of the city. Streetcar service in the Elm City ended on September 26, 1948 and the trolley viaduct probably came down with State St. Renewal project funded late in 1965.133 The end of the trolley era brought dieselization to the former Manufacturers RR, which would soldier on as part of the New Haven RR and beyond into the 1980s. Some trackage is in the ground and for sale to this day. The Belle Dock branch is still in place and was reconnected in 2002 over a new, center-lift Tomlinson Bridge made considerably more expensive by the need to support the track on its north flank. [6.9.2] Some former railroad sites give little indication of their past. St. Mary’s RC Church (1872) occupies the location of the Canal road’s original Temple St. terminus, and that track, pulled out in 1987, has become a ‘rail trail’ completed right into Yale's campus. The old overhead railroad bridges were being torn out and replaced in 2008. The Cedar Hill station site is today part of the Connecticut Transit bus yard off Humphrey St., the opposite side of the track marked by the dry cleaner at the corner of James St. The Cedar Hill yard, largely disused by Conrail after the burning of the Poughkeepsie Bridge in 1974 severed the Maybrook line, is a shadow of its former self. To the dismay of preservationists, the roundhouse there was torn down on March 22, 1989 as surreptitiously as the Cedar Hill station was built by the railroad in 1889. West of Union Station, excavation for the Church St. South project, planned since the 1950s and finally begun in 2003, uncovered the Spring St. roundhouse foundation and turntable pit dating back to the 1870s. Along the West River where the NYNH&H once connected with the old NH&D line, the remainder of the railroad trestlework was torn out with showman-like fanfare by New Haven mayoral candidate Joel Schiavone on September 25, 2001. Who knows what other artifacts of the Elm City’s railroad past are yet to be uncovered and either venerated or discarded. [RRC] in RG 041 at CSL to develop a complete list of the parallel attempts. 46. Adams, Robert B., "The Battle for Springfield," NMRA Bulletin 44.3 (Nov.
107. The New Haven Cut and Weekly Review, February 10, 1906, p.1-2.